This Spring, Sunday April 3rd through Wednesday April 6th, we will be sharing in a very special Renewal Conference here at Covenant. I am asking our entire church family to clear our calendars, plan to attend and prepare to be challenged and blessed. I believe God is providing this opportunity. I believe it is a way we can cooperate with Him as He awakens His Kingdom in us and around us. I believe our faithful “Yes” to our Lord in this event will prove to be a beautiful echo of His abundant and eternal “Yes” to us. 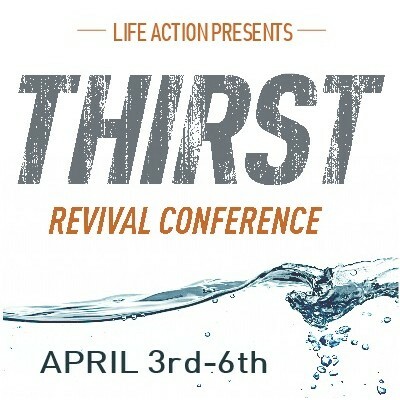 This event is called the “Thirst Conference.” It will begin Sunday morning and continue through the next four evenings. It includes elements for our whole church family—children, youth and adults—and will be entirely run by the traveling team of a well-respected organization called Life Action Ministries (We will provide hosting services, but all of us will be able to participate in the programs rather than lead them). Here is how the Life Action folks introduce this event: Prayerfully, we will seek God together. Truth and hope will be proclaimed. Lives will be transformed. The church will experience spiritual renewal. Families will be strengthened. The church’s fire for the Great Commission will be stoked up. With great hope and confidence, I ask you to make the necessary room in your busy life and join me for this transformative event in our life together as God’s people here at Covenant.